Sorry it has been so long since I've sat down to write. Had a great Memorial Day weekend and it went by waaaaay too fast. Got out of work a little early Friday and went home to pick up the dogs and went to the barn. Hung out the rest of the night and stayed in the camper with a friend and giggled and laughed until almost midnight, it was fun to be a kid again. Had minimal conversation with "G" only through casual texts. 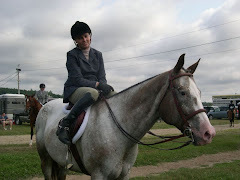 Saturday got up bright and early and asked if I could ride a training horse in the show the next day in the special hunter division, it was a go so I had to get ready. Watched a lot of lessons that day and hung out even though it was a little chilly. Just around sunset everyone had left the barn, I was the only one on the property. Walked out to Possum's paddock and hung out with him. I sat on the grass and he hovered over me like I was his foal and put his head on my shoulder for almost half an hr. We were both just looking at the sunset and enjoying the moment. It was nice to have some alone time with my horse and just hang out. "G" called and asked to show me his new car. Felt a little weird but told him I was just at the barn if he wanted to come by. I was relaxing in bed with the dogs and thinking about how early I had to get up the next morning for the show when the boy showed up. We actually had a pleasant time. He was respectful and nice and sweet, all the things that I liked in him. We chatted, it was easy, it was cold so he crawled in my camper bed. We both were exhausted so I gave permission for him to stay. Now it's not like I wanted him to leave. His touch, his kiss, the way he breathes, his smell just everything about him is familiar and inviting. It was a pleasant night and 5AM came way too fast. SO got up and showered and went to the show. Our barn always has a good time and we have quite a group so there is always someone to root for in almost every division. It was damn hot but I wasn't about to complain after the winter we have had up here. I rode well but Moonshine was a little freaked out for some reason. It was a wierd show day, many people fell off, horses were on edge and you could just smell something different about the air. "G" texted me and asked if I wanted to go out to dinner. I still had a flat class to go, but he was being so nice and was sweet last night that I started to plan it. He ended up showing up just as I was getting on for my last class. He congratulated me after and even offered to take out Moonie's braids for me. SO we went out to eat and he asked me multiple times to stay with him at his house. That house, my old house holds so many memories that it's hard not to be overwhelmed by them. But we went back to the barn to chat on neutral turf and I decided to go over and hang with him at the house. It was actually nice and easy but I want things to stay that way. We had a little serious talk and he was adament in the fact that he was done with this other girl because she was confused and a liar and blah blah blah. I'm afraid that this is just a pattern with him and her. I told him flat out that I am not a fall back person. That I require respect and have more to offer then what I was being used for. He seemed to understand and even talked about us getting together in the future. I informed him that it would still be good that I have the apartment for a year regardless with what happens with us. I think it would be good to have our own home bases, he agreed. So I stayed over, the next morning we laid in bed and chatted and relaxed. Got up and took a shower. He had a job to do and I had to go to the barn and then study for an upcoming test at work. 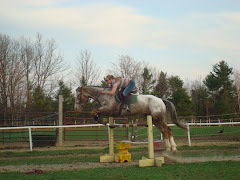 I got a call from the barn owner who said that her mare had just foaled out. Went to the barn and my breath was taken away. The little COLT, yes I said COLT and for you non horsey people that means it's a BOY was so damn cute. Just what I always wanted. I called dibs right away (in my dreams). Hung out yesterday, studied, watched some lessons and oh yeah got a massive sun burn on my thighs, oops. Ended up back at" G's" that night to watch a movie. Had junk food and enjoyed each other and went to bed at around 11. He woke me up at 7AM after he was done his morning routine. Asked me for a hug and a kiss and wished me a good day. Despite our many encounters this weekend it felt OK. My counselor calls it feeling out the edges. SO I'm going to chalk this weekend up as a positive in the book. It was filled with horses, animals, friends and the one guy that I really care about. Have a great day everyone. It's back to the grind for me, and maybe I'll blog on a little lighter subject tonight. Just had to get the weekend off my chest. So happy for you Molly! Looks like things are all coming together for you. Hopefully you'll be able to show at the next New Boston show. See yah at the barn!